Quarter Size Countertop Convection Oven Constructed of heavy duty stainless steel with a compact design perfect for countertops. 120 volt electric plugs in just about anywhere. Fits quarter size sheet pans, 3-1/2" spacing between shelves. 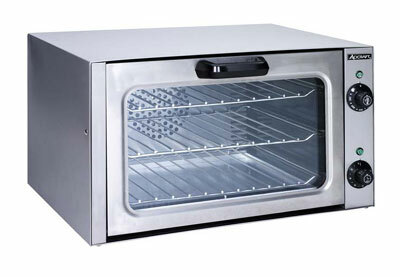 120 - 480F temperature range, manual controls, 120 minute timer, double wall glass door. CE marked, NSF. Cuisinart TOB-135 Deluxe Convection Toaster Oven Broiler (Stainless Steel) Manufacturer refurbished SKU: TOB135FR Features Spacious 0.6-cubic-foot capacity 9 functions including convection, reheat and defrost Toast shade control for consistent results Exact Heat sensor maintains precise oven temperature Easy to clean nonstick interior and removable crumb tray Digital controls with backlit display, 2-hour timer, and clock 90-day warranty Product Description The Cuisinart Deluxe Convection Toaster Oven Broiler has 9 functions, including convection, to handle your family’s cooking needs. You can bake delicious cakes, roast potatoes, and crisp juicy roasts with this kitchen workhorse. With 0.6 cubic foot capacity, the Toaster Oven fits a whole chicken, a 12-inch pizza, or 6 slices of bread, and is conveniently controlled by an electronic dial and LED buttons. The Exact Heat sensor maintains precise temperatures, and the Always Even shade control ensures toast will meet your family’s tastes.